Manually create the cluster topology model when nodes do not have similar SSH credentials required for an automatic import of the cluster topology. Import the topology of a DataStax Enterprise cluster that already exists in OpsCenter and is being monitored in OpsCenter into Lifecycle Manager so you can start centrally managing configurations. Lifecycle Manager imports the cluster topology and automatically builds the topology model in the Clusters workspace. If a cluster is not connected to OpsCenter, the cluster is not displayed in LCM and is not available for import. Note: Lifecycle Manager does not currently support managing DataStax Enterprise Multi-Instance nodes (also referred to as dense nodes). Note: At this time, Lifecycle Manager only supports importing DataStax Enterprise clusters installed from Debian (.deb) or RedHat (.rpm) packages. Ensure all nodes in the cluster you want to import use the same SSH credentials. 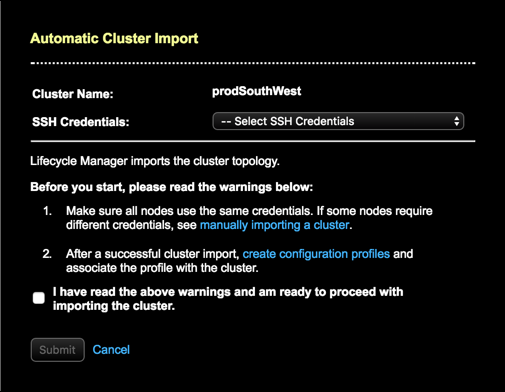 If some nodes require different credentials, see manually importing a cluster. Only the GossipingPropertyFileSnitch (GPFS) is supported for managing or importing DataStax Enterprise clusters in Lifecycle Manager. Lifecycle Manager currently does not support configuring nodes by network interface (listen_interface or rpc_interface). If a cluster is configured with those options, the import will fail. Reconfigure the nodes by listen_address and rpc_address rather than the corresponding interface options before importing the cluster. Datacenters must consist of a homogeneous node workload type. Mixed-load datacenters cannot be imported into Lifecycle Manager. If DSE Configuration Encryption is enabled, it must be disabled prior to importing the cluster into LCM. Clusters that are not being managed by LCM are indicated with a red plus sign in the Clusters pane. In the Clusters pane, select the cluster to manage. The Automatic Cluster Import dialog appears. Select the SSH credentials defined for the cluster. If nodes do not use the same SSH credentials, you must follow the instructions to manually import the cluster. Select acknowledgement of the warnings. The import cluster job begins processing. Follow the progress in the Jobs workspace. If unsuccessful, a dialog provides a link to review the job details. Create the necessary configuration profiles and associate them with the cluster, datacenter, or nodes in the Clusters workspace. Add a repository and associate it with the cluster in the Clusters workspace for running future install jobs.